When you have a baby, one of your main concerns is keeping them safe. The minute your little one is placed into your arms, your parenting instincts kick in and all you can think about is protecting them against the dangers of the world. What you might not have considered is that a lot of the dangers your little bundle of joy is going to face in the early stages of their life are actually found in your home. Baby proofing the home is one of the most important things you’re going to need to do. It’s also not as easy as you might think. There are many things you might not have even considered to be a potential baby hazard. Before you start panicking however, don’t forget that babies don’t typically start crawling until they reach around eight months, so there’s plenty of time to get things in order. If you’re struggling to identify potential hazards, below you’ll discover the top 10 baby proofing tips for the home. When you think of bathtub safety, the main thing that comes to mind is making sure the temperature of the water is just right. However, there’s a few things you should do to ensure the bathtub is safe for your little one. For example, adding a non-slip bath mat will ensure your baby doesn’t slide around in the water. As well as using a mat in the bath, it’s a good idea to have another non-slip mat on the bathroom floor. This will help ensure you don’t slip from the inevitable spills caused by your baby splashing the water. It will also come in useful as your little one grows when you’ll find yourself frequently chasing them around the bathroom! Another useful tip is to cover the spout of the tub with a faucet cover. If baby were to fall back, they could easily hit their delicate head on the spout so keeping it covered is an additional safety precaution. As your baby learns to crawl, it becomes really important to keep them away from medicines and cleaning products. Child-proof locks are fantastic and can help give you great peace of mind once your little one is on the move. It’s a good idea to place locks on all cabinets regardless of what is in them. Just opening a cabinet door can be hazardous as their little fingers could become trapped or they could hit their head on the door. The crib is the one place you associate as being safe to leave your baby. However, there are still a few safety tips you should be aware of. Mobiles for example, are great for keeping little ones entertained and to soothe them before bedtime. The trouble is, if you place them within reach of your baby, they could easily pull them down and injure themselves. Mobiles are largely designed to be seen but not touched. So, when your baby starts to learn how to lift themselves up, be sure to move the mobile away. Beware of adjustable mattresses too. To start, it is a good idea to have the mattress at its highest setting due to how easy it is to lift your baby in and out of the crib. However, it should be lowered as your baby grows to prevent them standing up and falling out of the crib. It’s recommended that around 5-6 months of age, you place the mattress on its lowest setting. It may seem like something you won’t have to worry about for a long time, but it’s highly recommended you fit window guards as early as possible. The minute baby comes along, life becomes a lot more hectic. After weeks of sleepless nights and struggling to just get through the day, the last thing that’s going to be on your mind is window guards! So, getting them fitted early is going to make your life a lot easier. If you don’t want to fit actual guards to the window, you can always opt for window stops instead. These basically prevent the windows from opening over four inches. The stove is one of the most dangerous appliances in the home for children. Your baby’s curiosity could end up causing them serious harm if you don’t take adequate precautions. Knob covers are often the first thing parents think to try. However, these aren’t actually the most effective way of preventing your baby from playing with them. They aren’t the easiest things to use so instead it’s a good idea to remove the knobs completely when they aren’t in use. You should find them pretty easy to take off. It may not be the most convenient option, but it is the safest. Ensuring the stove door stays locked is another very useful tip. A lot of accidents happen when children figure out how to open the door. They can either burn themselves if the stove is on, or injure themselves by trying to climb up on the door to reach things on top of the stove. Most self-cleaning stoves come with an automatic lock. Electrical sockets are like a magnet to young children. The moment your baby learns to move around, they’re going to head right to anything new they can see. Electrical sockets are usually at perfect eye level for babies, so they’re one of the first things you need to cover up. You can actually buy child proof sockets. To fit them you will need to take the original sockets off so it requires minimum DIY skills. However, the safety benefits they provide are definitely worth the extra effort and cost. Safety gates are a parent’s best friend! There are numerous types available and they also come in different sizes. This means you’re going to have to take accurate measurements before you buy them. You can use them at the bottom and top of the stairs and in-between doors. When buying safety gates always pay attention to reviews and safety ratings. Some are designed much better than others so it’s important to make sure you’re choosing the very best quality and safety-approved models. Before your baby came along, you probably got used to using things like your hairdryer, then simply placing it down until the next use. Similarly, you probably gave little thought to the cables running along the floor. However, now your little one is here, these everyday habits can actually be really dangerous. Whenever you use an appliance, make sure you unplug it and place it out of reach until it needs to be used again. Use cable ties too, to keep any cables up and out of reach. Babies are easy to entertain. You don’t need a lot of money to keep your little one happy for hours on end. You can get away with giving them things from around the house like empty boxes, pegs or toilet rolls. One thing you shouldn’t give them, regardless of how entertaining it can be, is pots and pans. This is actually a common thing for parents to give their little ones, but it can prove problematic later on. As they grow and start to walk, if they see a pan on the stove, they’re going to want to grab it and play with it. If it’s a pan full of boiling water, this could be extremely dangerous. So, avoiding giving them pots and pans will lessen the likelihood of this happening. One thing that’s easy to overlook is the TV cabinet. If your television is placed on top of a unit with drawers, there’s a chance your baby could attempt to climb up the drawers, in turn tipping the whole unit over. Installing anti-tipping hardware onto the cabinet or securing it to the wall, will help to prevent your baby seriously injuring themselves. If on the other hand, your TV is on a cabinet, simply push it back as far as it will safely go. If you like to play loud music in your home or have the television volume up high during your favorite sports games, it’s important to make sure your baby’s little ears aren’t getting damaged from the noise. We have an ear protection kit available for ages 2-12 that is perfect for use around the home (even while your baby or toddler is sleeping) and is even powerful to protect your little one at concerts, stadiums, and other loud environments. You can check it out by clicking here! 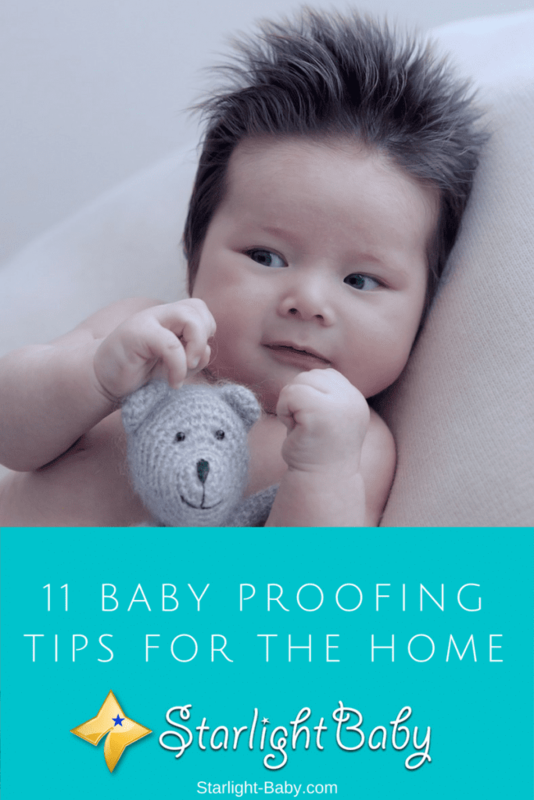 The 11 tips above are some of the most overlooked baby proofing tips you can follow. Got any that aren’t on the list? Please share them below! One of the things that many parents do not put much concern is baby safe power socket. When your little one starts crawling or walking, they begin to take a lot of interest including placing fingers inside the holes in the power socket. If you do not have baby safe sockets, try to tape the sockets that your baby can reach. True, power sockets doesn’t seem to be a major concern. You’re right, it is a must to put a cover on it because babies are very inquisitive and curious as regards to holes and could put their fingers on open sockets. Yikes!